It has arrived, one of the most hallowed weeks of the season, pepper planting week. I know that sounds like Daytona Speed week or ACC Tournament week or something equally exhilarating but this is the last of the big pushes for the spring. Covering the Big Tops and planting the main crop of tomatoes is big, sliding the little tunnels is a big job too but pepper week is easily as complicated and important as those. Sixteen one hundred foot long beds, over 2000 plants, 32 varieties to keep track of I am tired just thinking about it all. It started eight weeks ago when we seeded nearly 3000 seeds into small 200 cell flats, then four weeks ago we moved the best looking of those tiny seedlings up into 50 cell flats and the perfect two inch cell size for them to grow a good root system. 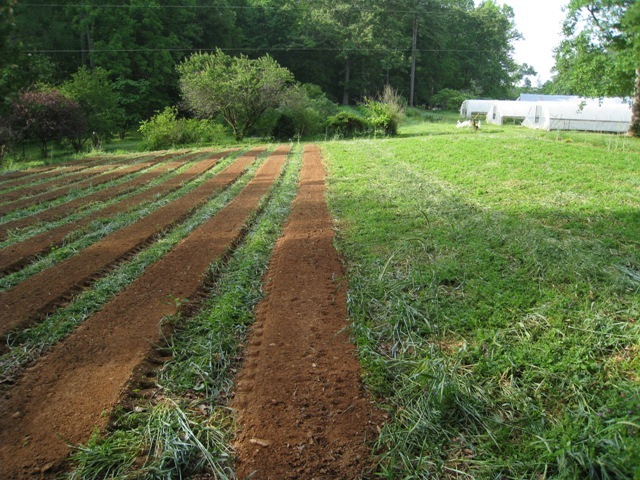 The same week I mowed and turned under the beautiful cover crop on the eight beds that will hold the hot kinds and the more “delicate” sweet varieties, leaving the cover to grow even more on the area that will be the no-till home of the sweet bells. Two weeks ago, before the big storms, I rolled down the huge cover crop in the no-till zone so it would be laying parallel to the direction of the rows of plants. Yesterday, after the month of decomposition, I re-tilled the eight beds giving us a beautiful soil to plant those hot peppers into. I also re-rolled and crimped the cover crop in the no-till zone which will help it on it’s way to dying and turning into a thick mulch on the soil. Today we will roll out irrigation lines on each one of those eight beds and stretch the landscape fabric over them. We think that the hot varieties and some of the smaller fruited sweets benefit from the warmth of a raised bed and of the black fabric, some of them like the habaneros and the aji dulces take so long to set fruit that the warmer the soil early on in the season is what makes the difference. The vigorous sweet bell peppers do just fine in the cooler, non tilled soil. Today or tomorrow, we will cut slits in the thick mulch of the no-till zone to tuck the plants into. Finally tomorrow we will plant, trying for the last time to not mix up the different varieties so we can accurately know who is who when it comes time to picking and evaluation. Pepper week, it is a long time in the making.